Satellite images of the Greenwich Peninsula have finally been updated on Google Maps. Before/after pictures capture striking changes across the Greenwich Peninsula over a period of more than four years. Architects behind New York's High Line, DS+R, have designed Phase One of the Greenwich Peninsula's 5 km running track. Five elevated 'islands', connected by a sleek floating walkway, will form a route above a new plaza at Upper Riverside. Greenwich Peninsula developer Knight Dragon plans to replace North Greenwich tube station with a landmark design by architect Santiago Calatrava. Photos from the roof terrace of the newly completed Fulmar building on Lower Riverside of Greenwich Peninsula (Submission). 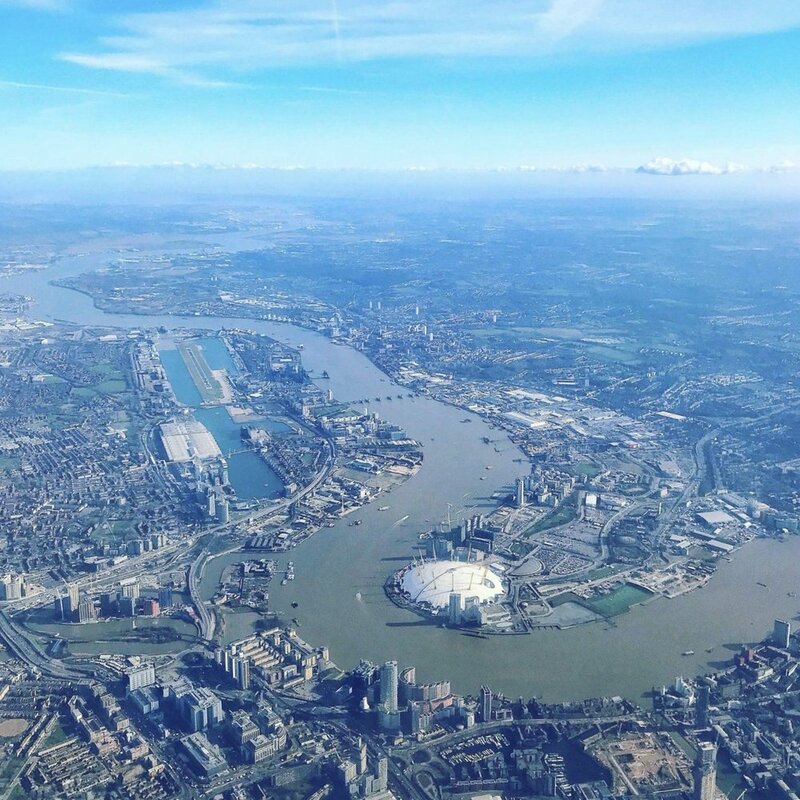 A photo collection capturing views from Isle of Dogs across the River Thames to Greenwich Peninsula. Construction of The Optic Cloak, an architectural flue stack for the new Low Carbon District Energy Centre on the Greenwich Peninsula, photographed between November 2015 and September 2016. Listed buildings across the Peninsula and East Greenwich, from a row of workers' cottages dating back to 1800 that represent the first homes on the Peninsula, to an architectural tunnel ventilation tower now enclosed within the dome of The O2. AEG Group, owners of The O2, propose a 36-storey residential development for a site immediately south of The O2, creating 395 homes (20% affordable) with retail units fronting onto Peninsula Square - replacing previous planning permission for an 8-storey office block. Photo collection celebrating art and sculpture that reflect the Greenwich Peninsula's rich industrial and engineering history. An Estate Service Centre is proposed for the Greenwich Peninsula, which is to include a parcel depot and waste management services that are supported by a fleet of electric vehicles to minimise noise and air pollution levels. Greenwich Peninsula developer Knight Dragon has put forward proposals for four residential developments on the south of the Peninsula, creating 1,141 new homes on the Lower Riverside and Brickfields neighbourhoods. Residential development has ramped up on the Greenwich Peninsula and a revised 2015 Masterplan aims to deliver more ambitious plans, permitting a total of 15,700 homes across the entire project. Views across the Greenwich Peninsula and beyond from the 32nd storey penthouse of The Waterman (M0104) tower on the Lower Riverside development. Views across the Thames to the Greenwich Peninsula from Coldharbour, New Providence Wharf and Trinity Buoy Wharf. Construction progress on the Greenwich Peninsula summarised in 80 pictures. Knight Dragon, developer of the Greenwich Peninsula, propose to build a 5 km running track around the perimeter of the development. The route would wrap largely around the Thames Path, crossing a network of parks and riverside spaces. Knight Dragon's high-rise Upper Riverside development, designed by SOM Architects, will create 1,007 apartments, 20% of which are allocated affordable homes. Buildings 1 and 2 (21 and 23-stories, respectively), located closest to The O2, are due to complete in 2018, with the wider scheme completed in 2020. Opened in mid-December 2015, the InterContinental Hotel - The O2 is the brand's second hotel in London. Designed by architects Lifschutz Davidson Sandilands and operated by Arora Hotels, the 18-storey hotel and conference centre has 453 rooms, 5 restaurants and bars and Europe's largest pillar-free ballroom. The 10 storey Fulmar building by Knight Dragon contains 60 private apartments, located midway between the park and the riverside of the of Greenwich Peninsula. Architecture by DSDHA and interiors by Jestico + Whiles. A further 79 units comprise affordable homes provided by L&Q. Completion expected in Autumn 2016.